Product sales now account for 50 percent of F&I income per vehicle retailed at Ganley Automotive's 17 stores, up from 40 percent in April. 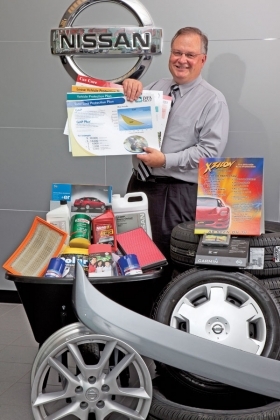 The key, CFO Joe Fornal says, is marketing to customers' needs. At Ganley Automotive, a large dealership group near Cleveland, finance and insurance income seriously lagged the $1,000 per vehicle typically reported by publicly traded retailers. With Ganley's per-vehicle income at less than $600, management realized that plenty remained to be gained. Some stores did better than others. But there was no mandate to use menus with every transaction, no consistent product pitch used throughout Ganley's 17 stores -- and sales of products such as maintenance contracts suffered. "We had more finance reserve than we had income from sales of F&I products," Ganley CFO Joe Fornal says. "We're trying to get that reversed." Ganley faces the same challenge as dealerships across the country: How to boost product sales as finance revenue fades. Regulatory oversight and caps on the finance reserve -- the portion of a customer's finance charge that a dealer earns for arranging the loan -- make the shift to increased product income more important than ever. But to avoid the same problems experienced on the finance side of the office, managers must figure out how to do it without alienating customers. • Increasing compensation to sales representatives or F&I managers for hitting product sales targets. •Mandating a consistent sales presentation and using a menu every time. •Measuring results daily to determine what processes or product pitches need work and how individual stores and specific employees are doing. •Introducing the customer to the F&I manager earlier in the process. An informal chat on the sales floor can reduce the customer's fear of the F&I office and help the manager better tailor the product offered to the customer's wishes. Sonic Automotive Inc. looked to its best-performing stores to come up with its companywide sales goal of two products per retail transaction going through the F&I office. About 20 percent of Sonic's 123 stores already meet that benchmark, says Jeff Dyke, the company's executive vice president of operations. Since the goal was established this year, the companywide average has improved from 1.15 products per transaction to 1.2 products, Dyke says. The emphasis is on products that bring customers back to the dealership -- and service contract sales are up. "The amount of money we're making on rate is reducing -- and it probably should," Dyke says. "So we're making sure that we can provide our consumer with a valuable product to protect their vehicle." The door is open for more scrutiny of product sales, the NCM experts say. Some states already have caps on prices that dealers are allowed to charge for products such as service contracts. "It begs the question: Will more states follow suit," Faletti says. Sonic's Dyke, for one, is not concerned that increased scrutiny or customer backlash will become a problem on the product-sale side of the F&I office. Neither is dealer Brown. Reinventing product sales is a must to make up for lower finance reserve income, which he predicts eventually will be reduced to flat fees. Atlantic Automotive Group cracks down on compliance, training staffers and getting them certified with the Association of Finance and Insurance Professionals. The association audits transactions, including frequent spot checks. "We want to sleep at night," Atlantic's Brown says. "There are still just too many people out there selling air to customers. It's terrible, and it gives us a bad name." Audits are a great way to head off problems, lawyer Whann says. Documentation also is key. He recommends that dealers have customers sign product purchase confirmations. "Most of the time, it's done in the right fashion," says Whann, a former Ohio assistant attorney general. The days of packing payments with undisclosed products are in the past -- and products are more reasonably priced today, he says. Dealers are switching their focus to boosting revenue from the product side of the F&I office. Here's why. • Finance reserve income is dropping. • Products such as service contracts bring customers back to the dealership. • More products are available to sell at more reasonable prices for customers. Sonic trains employees to use a "playbook" process that includes a needs assessment and early introduction of the customer to the F&I staffer. On Aug. 1, Sonic is rolling out a test that will establish nonnegotiable prices on F&I products at nine stores in Ohio and near Washington. "We'll be a lot more aggressive in how we price our products," Dyke says. "Then there's no wiggle room for an F&I director to move off that price." That one-price test will run through the end of the year, and Sonic will expand the approach if it proves its merit. Targets such as Sonic's aren't uncommon. AutoNation Inc. also aims for two products per retail sale, and its current rate approaches that, spokesman Marc Cannon says. But it's not a hard-and-fast rule. F&I representatives are trained to tailor their product pitch to what makes the most sense for the customer as well as to what delivers the best return for AutoNation. "We currently have multiple initiatives under way in the product area, including specific manufacturer training, service drive sales programs, direct marketing programs and targeted promotions on specific products," Cannon says. Dealers have set product sales targets for years, but those targets have become more visible as scrutiny on the F&I office has increased, says Jeff Bethel, director of 20 group operations for the consulting firm NCM Associates. Dealers often challenge managers to achieve a certain penetration of a product such as service contracts, Bethel says. The variety of available products has jumped in recent years, he says. One example: tire and wheel protection, thanks to ever-bigger rims from the factory. Michael Brown, COO of Atlantic Automotive Group on Long Island, N.Y., pays bonuses to his staff if they achieve sales better than 1.25 products per transaction. Since the incentive began early this year, Atlantic's average sales of core products such as maintenance contracts has jumped from just under one per vehicle to about 1.5, Brown says. "It has done wonders for our penetration of those products," he says of the bonuses. Captive finance units also heavily market such products to dealerships and offer rewards for hitting targets, says NCM CEO Paul Faletti. Besides bonuses, another common incentive is a free trip. Hitting targets has been more difficult in the past 18 months as tighter credit has limited the amounts that lenders will advance on a vehicle purchase -- and thus the amount available to buy finance products, Bethel says. But with credit loosening, the ability to work product sales into the loan is rebounding. Targets can work for both dealer and customer if the customer's needs and wishes are respected, says Keith Whann, a lawyer in Dublin, Ohio, who represents dealers. "The problem is when the goal or target becomes a mandate," Whann says. "If it becomes, 'You are going to get two sold every time,' that's a problem. Not every customer is going to do that." Back at Ganley, a new F&I supplier and its associated training have helped. Service contract sales are up. Since April, the group's F&I income per vehicle sold at retail has jumped from below $600 to $825. The product side has gone from contributing about 40 percent of that income to slightly better than 50 percent. It all goes back to getting to know your customer, Fornal says. "They have needs -- listen and market to them," he says. "We're starting to recognize that."